The Japanese city of Kobuchizawa is home to the Nakamura Keith Haring Collection and Pop Shop. The museum includes the Pop Shop featuring brightly-colored pop art merchandise, the acquisitions of art collector Kazuo Nakamura, and exhibitions from artists and designers related to Keith Haring and the pop art movement. 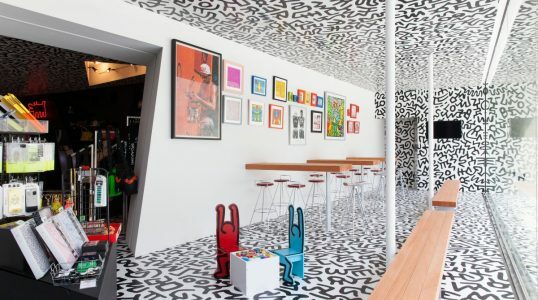 The architecture of the Nakamura Keith Haring Pop Shop was designed by Atsushi Kitagawara. The noted architect designed the building by combining modern aesthetics and traditional Japanese building techniques. Set among mountains and forests, Kitagawara’s modern architectural design and Haring’s pop artwork stand out in relation to the area. During the winter time, January 11, 2011- March 18, 2011.